Employee engagements. Benefits. Wellbeing. Leadership & Management Development. Dr. Dorothy Andersen and colleagues. 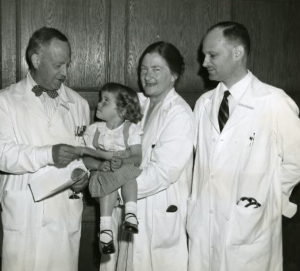 Cystic fibrosis as a separate and distinct condition was first described by Dr. Dorothy Andersen in 1938. She separated cystic fibrosis from celiac disease and is the one who coined the name “cystic fibrosis.” The disease was also called “mucoviscidosis” due to the prevalence of thickened mucous in sufferers of the disease. Interestingly enough, European folklore from the Middle Ages records a saying… “Woe is the child who tastes salty from a kiss on the brow, for he is cursed and soon must die.” People with cystic fibrosis often have excessive salt in their sweat and some researchers believe this saying describes infants and children with cystic fibrosis. The famous Polish composer Fredric Chopin died at the age of 39 from respiratory failure after a lifetime of malabsorption and lung infections. It has been speculated that he may have suffered from cystic fibrosis. At the time Dr. Andersen identified cystic fibrosis as a disease, the average life expectancy for infants born with the disorder was six months. The connection between high concentrations of salt in the sweat and cystic fibrosis was made in 1948 by Dr. Paul di Sant’Agnese in New York City. One of the first treatments for cystic fibrosis was mist tent therapy. Children would sleep in clear plastic tents placed over their cribs or beds in which a fine mist of water and various drugs was injected for the child to inhale. The rationale behind this is that the mist would thin the thickened mucous in the lungs. By the early 1960s the average life expectancy of a child with cystic fibrosis had reached 10 years. Mist tent therapy is no longer in use for cystic fibrosis patients as more effective treatments are now available. By the 1980s, with the increased use of antibiotics and percussive therapy to treat cystic fibrosis, many patients began surviving into their teen years. In 1989 CFTR, the gene responsible for cystic fibrosis, was identified. This allowed for the development of drugs to specifically restore CFTR function in people with cystic fibrosis. Advances in medicine also allowed for other ways to treat the disease including lung transplants. Today, many people with cystic fibrosis are living well into adulthood and some patients are entering middle age. With continued research and treatment, it is hoped that in time cystic fibrosis will become a manageable disease with those afflicted living normal or close-to-normal lifespans.